Response: Current guidelines recommend a systolic blood pressure treatment target below 140 mm Hg for most people. Since the publication of SPRINT however, many have suggested guidelines should be changed, recommending further blood pressure lowering. We performed a systematic review and meta-analysis of randomized clinical trials comparing different blood pressure targets or antihypertensive treatment verus placebo. We separated primary preventive trials from secondary preventive trials, and stratified primary preventive trials by mean baseline systolic blood pressure. The analyses included 74 trials, with in total > 300 000 participants. Interestingly, we found that treatment effect was dependent on baseline systolic blood pressure in people without previous CVD. While primary preventive treatment reduced the risk of death and cardiovascular disease if systolic blood pressure was 140 mm Hg or higher, treatment effect was neutral if systolic blood pressure was below 140 mm Hg. Response: I think the most important message is that the effect of blood pressure lowering depends on the patient’s blood pressure level. In patients with high blood pressure, we can effectively reduce mortality and cardiovascular morbidity with cheap and well tolerated drugs. At normotensive levels, you cannot expect treatment to reduce the risk of cardiovascular events further. Focus should thus be on getting all patients below 140 mm Hg. 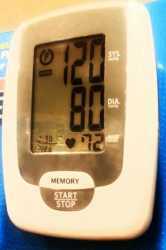 This entry was posted in Author Interviews, Blood Pressure - Hypertension, Heart Disease, JAMA and tagged AHA17, blood pressure, heart disease, hypertension by Marie Benz MD FAAD. Bookmark the permalink.